What’s this? A video game review on a travel blog? Yes indeed folks. Trail felt that as traveling geeks and gamers we should write about our virtual adventures as well as our real world ones. Fallout 4: The latest mutation of the Fallout franchise improves its physical attributes but has neglected its social skills. All the fallout games (setting aside some spin offs) have been role playing games where you play as a resident of a nuclear fallout shelter who is compelled to leave his home and enter an irradiated wasteland filled with danger and adventure. The series is famous for black humor, pop culture references and a quirky retro future aesthetic. Game play is a mix of tactical combat, exploration, resource management, and role playing dialog. Stories tend to revolve around how the moral choices made by your character affect the post apocalyptic society. This incarnation, like Fallout 3 before it, is a first person RPG where combat happens in real time punctuated by use of the VATS system which slows the action down briefly so you can aim precisely in the midst of the carnage. You roam the wasteland more or less as you choose searching for what you need to survive and alternately helping or killing the many strange folks you come across. In a departure from previous games this story starts before the bombs fall giving you a glimpse of life pre-apocalypse in a brief pro-log where you also define your characters appearance and abilities. Quickly you discover you are very much wronged as your spouse is murdered and your infant son stolen while you watch helpless in a cryogenic pod. From there you can go in search of your son following the main narrative arc, or strike out on your own to explore the world. In addition to the usual searching for resources, killing mutants, and talking with the locals Fallout 4 has added detailed item crafting and base building into the mix. As you play you can rescue or secure locations on the map where you are encouraged to create wasteland bases and settlements for your own benefit or to make the lives of those in your care better. I found fallout 4 to be good addictive fun. I’m a fan of the series and a die hard RPG enthusiast so likely it would have to be pretty bad for me not to enjoy the heck out of it. That said, its not all roses here. Like so many games from Bathesda it has a great number of strengths and some stand out weaknesses. If you have played Fallout 3 or Fallout New Vegas 80% of the game play will be entirely familiar. The other 20% or so will however stand out very quickly as you play through the game. 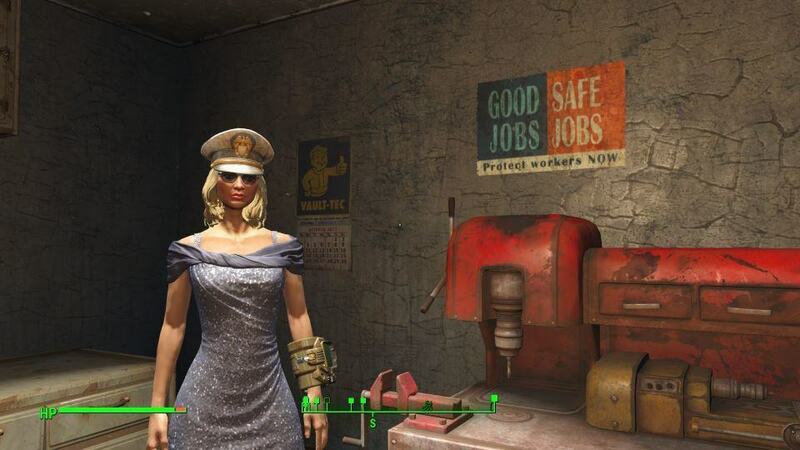 In many areas Fallout 4 is a step up from previous games. The combat here is much improved from previous incarnations. Aiming and shooting feels more like a polished shooter compared to it’s rather clunky predecessors. Much of this is due to better controls and smoother animations, but under the hood its clear they have done work with the core mechanics as well. In the older games combat at higher difficulties tended to break down forcing you into exploitative tactics in some fights. In Fallout 4 the harder settings are challenging but retain a smooth feeling of given and take between you and your foes. 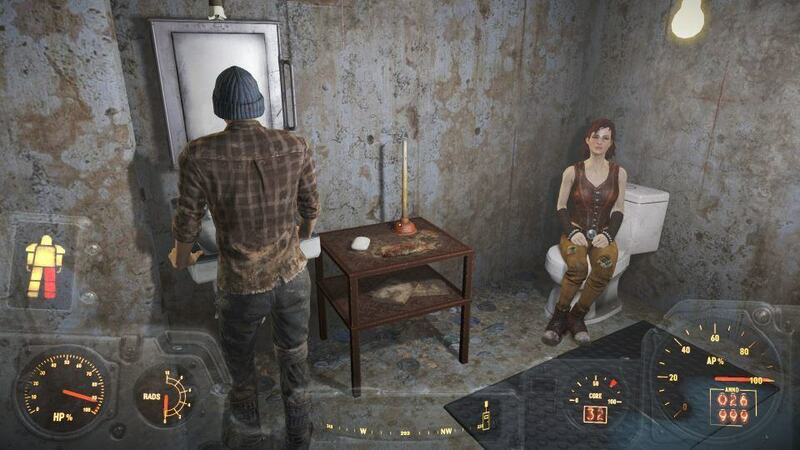 Fallout 4 also excels in its environments. All the modern games have had vast and immersive wastelands, but here each abandon building and stretch of wasteland feels custom designed. There are very few cookie cutter environments and each building or ruin has unique elements. You feel like these are all real places with their own character making exploration of every inch pretty interesting. Scavenging the wastes for resources is much improved as well. Scrap of all kinds can be dismantled to get raw materials which can be used to modify equipment, build bases, create healthy meals, and brew up some chems. Weapons can be modified in a myriad of ways, both changing their function and potency. Weapons no longer degrade but as you level up you will want to keep your arms and armor up to snuff which keeps you searching for parts to make that perfect shotgun or sniper rifle of your dreams. I’m also fond of what they have done with power armor. As where before it was just one more type of armor you could find, in Fallout 4 it gets a lot of special attention. Each part of your armor can be upgraded and customized in various respects. Suiting up feels like stepping inside a walking tank, complete with its own displays, sounds and animations. Also new is the need for Fusion Cores to power your armor. As you fight it depletes and when it runs out you can barely move in the stuff. You get your first suit early in the game but are only given limited power. At the same time they throw you up against some serious foes who without the armor would be nearly impossible to overcome. The message I got was that your power armor was something you put on for a serious fight, a limited resource to be tapped when you know the action will be hot and heavy. In practice however I found it pretty easy to keep Fusion Cores on hand and I work my armor nearly all the time. At least on the highest difficulty this was probably a blessing, it by no means made the content trivial, just gave you a fighting chance as long as it holds out. Beyond the Fusion Cores maintaining your armor also requires pretty hefty quantities of materials scavenged from the wastes to repair and upgrade it. I found all this pretty fun and I had a pretty personal attachment to my armor, making sure it was up to snuff and choosing how to style it. If there was any down side it was that the myriad of outfits and conventional armor had little use in my play through. 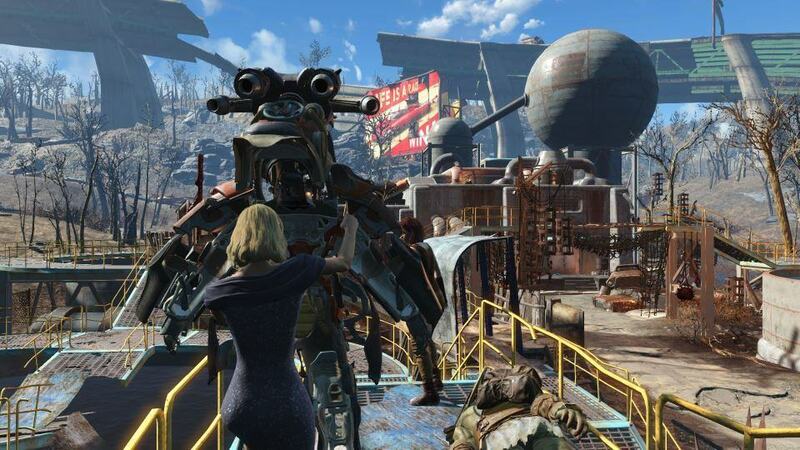 Finally Fallout 4 introduces the ability to establish and build settlements in the wasteland. These can either be personal workshops or places where you help a group of settlers survive the horrors of the waste. You can work with existing structures or build entirely new buildings. If you want folks to thrive there you need to work in food, water, shelter, and defense into your plans. While it has its limitations, the ability to make your own place in the wasteland is appreciated and ultimately enjoyable. It may not have an affect on the narrative of the story, but it does help you create your own story during play and that can be even more rewarding. In other areas the new game falls a little short. For the first time the central story of the game is something of a narrative railroad. You are married and have a child and both are taken from you in the opening act. Your character often expresses their desire to get their child back and the main story line is driven by this motivation. Given that, what sense does it make to go around helping random settler, mutants or other denizens of the waste while you think your child is in the hands of murderers? In a game where the best fun is had exploring the crazy environments and doing strange and interesting side quests, the character the game portrays should by all means avoid these distractions. This dissonance tends to destroy immersion every time the main plot rears its head. A related complaint is the dialog system they chose. Abandoning the older system of selecting from different lines of dialog, every interaction offers exactly 4 choices and you are only given a vague indication of what your character might say. Typically these boil down to: asking a question, agreeing to help, refusing to help, or saying something sarcastic (which tends to have no effect). Only one of these will ever do anything to the plot, agreeing to help. Everything else is just a delay of making that choice or postponing whatever story the dialog involves. If you want to have fun you have to say yes. While it doesn’t ruing the game, this is really the most disappointing aspect of Fallout 4. My final critique is leveled at the writing. In a wasteland filled with murderers and thieves your character is almost instantly trusted by everyone. You can recruit a number of followers, many with fun stories and vibrant personalities but often this is undermined by the systems where you bond with them. Some characters are simply made happy when you put on your power armor. Do it enough times and they will proclaim you are the best friend they have every known, baring their heart to you and asking for your sage advice. Do one mission for a faction and you become a trusted member of the team, sometimes their new leader. While that’s the sort of thing you want to achieve, there is little sense you earned it. And then there is the conclusion to the story. I’ll leave off the specifics but it boils down to a binary choice which I and many others simply found unsatisfying because it forces harsh outcomes many of which needlessly lead your character to betraying likely allies without any good motivation to do so. As one blogger put it, the best choice you can make, morally and for your own benefit is to do nothing, simply leave the story unfinished. While I went ahead and completed the story, I absolutely felt regret and would have no matter what I chose. A good story can certainly end in a tragic choice, but this choice felt entirely forced and unjustified by the story leading up to it. Many fans of the series were also upset about changes to the way you build your character. In past games there were three primary character building elements: SPECIAL stats, Skills, and Perks. Fallout 4 eliminates Skills from the mix while expanding on the Perks system. The result is something more like a character ability tree found in a great many other games. Ultimately I found that this didn’t impact my enjoyment of the game since choices formerly made with skills, were simply shifted into choosing perks (which are granted at every level now). I still had fun building my character, making meaningful choices and for me that’s what counts. It may sound like I’ve a lot of complaints here and yet I gave this a solid recommendation. What may not be apparent is the good here really outweighs the bad, and the bad is more a matter of backsliding on elements that were previously best of breed. The writing and story aren’t awful, they just aren’t up to the series sterling standards. The core game play of exploring a nuclear wasteland, battling its many monsters, discovering strange and interesting goings on, and becoming a savior of the wastes is fully functional and many of the annoying mechanical problems with combat (which you do a lot of) have been cleaned up. The new settlement building system and all the crafting really give you the feeling that this is your wasteland and you can make a difference here in a way previous incarnations did not offer. On balance this is not my favorite Fallout game (that would be either Fallout 2 or New Vegas) but it is a worthy member of the family and I found it hard to stop playing once I started. Even though I’ve finished the story, I’ll be back to do some more exploring into the hidden corners of the wasteland just to see what’s there and perhaps collect some more materials to build my perfect workshop.